Map - See West NSW Map. Some of Australia’s most beautiful National Parks are in New England, offering world renowned trout fishing, hiking, camping, nature tours and kayaking. But there is much more, with history and heritage of bygone times, and all the things that make for a great holiday, good food, quality accommodation, places of interest and tours with lots of things to see and do. New England is also known as the ’Big Sky Country’ for its great views. Here, you can enjoy eco tours and adventures such as whitewater rafting on the Gwydir River or you can just come here for a relaxing rural escape. The town nearest the National Parks of Oxley Rivers and Werrikimbe is Walcha. Places of interest include Oxley Rivers with some very spectacular waterfalls and Werrikimbe is known for its beautiful rugged scenery. There are excellent camping grounds available at the parks. Guyra, the gateway to the west and is at the Top of the Tablelands hsd three heritage railway stations, a historical museum and the Antique Machinery at Guyra Station. Here, places of interest include The New England National Park, Guy Fawkes River National Park, the Styx River National Park and Cathedral Rock, all within easy reach of Guyra, have camping areas and walking tracks. Armidale has a cosmopolitan atmosphere as it is known as the regional capital of education and culture. It enjoys cool summers, a splendid spring and autumn, and frosty winters. With the University of New England situated there as well as a number of large boarding schools, there is a lively atmosphere, yet the town has many attractive historic buildings, parks and gardens to complement it all. Places of interest include the New England Regional Art Museum, Armidale Folk Museum and the restored Saumarez Homestead, are all worth a visit. Tamworth, another regional centre, is the country music centre of Australia and of course has the Tamworth Country Music Festival. Thousands of people gather from all over the country and the world to celebrate Australian country music at its finest. Held in January every year, buskers head for the streets, line dancers dance, while the pubs and music venues are packed with performers and fans. On the south side of Tamworth, you can see the 12 metre tall replica of the Gold Guitar award given to the winners and visit the Golden Guitar and Gallery of Stars Wax Museum. The long chain of National Parks and Reserves in this region protect the diverse Australian flora and fauna, which is quite different from that found in the coastal regions of NSW. The Central Eastern Rainforests comprise of three parks, Gibraltar Range, Oxley Wild Rivers and the New England National Park. Many of the parks have camping facilities as do others in the region. In 1880, black Opal was discovered at Lightning Ridge. Originally dug out by hand in extreme conditions, the black opals found here were the first in the world. 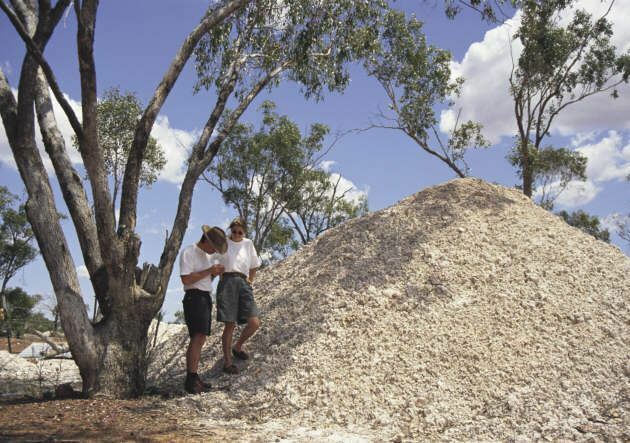 Today, Opal is still mined here and Lightning Ridge provides a fascinating view of the past and present of Outback life. There are 2, 3 and 5 day wilderness tours on Horse through the Blue Mountain Gorge. There are chances to fossick for gold or gems at Uralla. Try Rainbow and Brown Trout fishing at the many crystal clear streams around Guyra and the National Parks. From Sydney, take the F3 Highway to the New England Highway through to Tamworth (415km), then to Armidale (525km) and Glen Innes (625km). The Gwydr Highway between Glenn Innes and Grafton goes through the World Heritage Listed Gibraltar Range National Park - great for views, picnics and walking tracks through the bush. 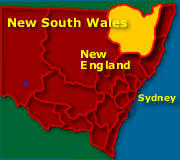 Map shows New England Region - See West NSW Map. One great way to experience the friendly hospitality of New England is to stay at one of the many Bed and Breakfast or Farm Stays available. There are also cottages, boutique guesthouses, motor inns, hotels and motels to choose from. View Resorts, Hotels, Motels in NSW Australia. Camping is permitted in many of the National Parks but a license is needed from the National Parks and Wildlife Service. Thought about a different kind of holiday? 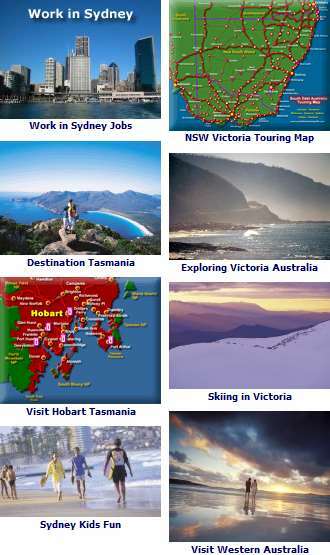 See jobs in Australia.